Pakistan versus India is not just a game. It is an event of epic proportions keenly watched by over a billion people around the world. The battle between the two teams is always anxiously anticipated, and when it happens in a World Cup, the stakes are at another level altogether. On February 15, 2015, Pakistan and India will take the field once again and open their World Cup campaigns on the back of a less than ideal build up. Both teams have been under significant pressure entering the tournament. India have had a horrendous two and a half months during which they have lost all their international matches in Australia. Pakistan, on the other hand, have had a disastrous year of ODI cricket where they have not been able to win a single series. India, ranked number two in ODIs, despite their less than favorable run up to the World Cup, will enter the field on the 15th as firm favorites. On paper, India's team is significantly stronger; man for man each one of their top 6 batsmen is arguably better than Pakistan's. The Indians have been playing in Australia and are accustomed to the conditions; Pakistan's entire squad comprises of only three players (Younis Khan, Shahid Afridi, and Umar Akmal) who have previously played an ODI in Australia. And above all, the mother of all statistics, the dreaded number 5. Pakistan have never beaten India in the five times they've faced off in World Cup encounters. Despite all this, there are enough reasons to believe that this time round, Pakistan will finally turn the tables. 1. The last time a Pakistani batsman hit a 6 in the final over against India to win the game by one wicket, it scarred an entire generation in India, which could not recover for a decade and a half. I don't need to remind anyone what happened in the last ODI played between these two teams. Two words: BOOM BOOM. 2. It might be 5-0 in India's favor but it is 3-3 in the past four years since the last World Cup. Pakistan just need to hone in on the fact that India is winless in Australia, apart from their warm up win against Afghanistan, for about 10 weeks and keep reminding them about that. 3. India's mighty batsmen don't look all that mighty when the play in Australia, or against Pakistan. 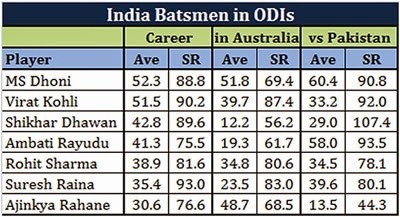 MS Dhoni is the only one who has maintained some level of consistency across all three: Career, in Australia, and against Pakistan. 4. Sohail Khan said the famous words "Kohli wohli hoga woh apne ghar me" (Kohli is a champion only in his backyard). That may sound like an empty threat considering that a relatively unknown pacer is sledging one of the world's best batsman. But it really isn't that empty a threat. 5. Pakistan's pace attack is the most inexperienced in this World Cup with their five fast men combining for an ODI experience of 97 matches. In terms of combined average, economy rate, and strike rate, they rank pretty low low as well. But the only team in this World Cup that ranks just above them is India. 6. SHAHID AFRIDI. Not only is he Pakistan's biggest match winner ever in ODIs (32 man of the match awards), he is also the team's key bowler in this world cup given the inexperience of the pace attack and absence of Saeed Ajmal and Mohammad Hafeez. Afridi has always performed exceptionally well with the ball in ICC tournaments and the bounce he will get in Australia will make him even more dangerous. 7. Nasir Jamshed is back for Pakistan, and even though he has not had a good time in international matches of late, he has absolutely dominated India every single time he has played against them. 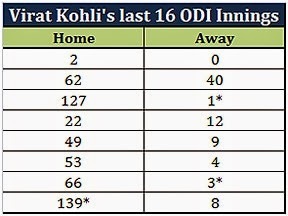 India will be wary of him at the top of the order. 8. Misbah-ul-Haq and Shahid Afridi were at the wrong end of the result in the final of the World T20 in 2007. They were on the losing side again in the semi-final of the World Cup in 2011. This is their last chance to redeem themselves and give the Pakistani fans what they have been waiting for for 23 years! It is going to be a gargantuan task but the Green shirts are up for it. They are more determined than they have ever been before and we all know what the Pakistanis are capable of when they have their backs well and truly to the wall. Sunday, February 15, 2015 This comment has been removed by the author.